Mogwai have always been masterful with compositions that can come off as pure anticipation build to the uninitiated, an overly simple generalization for the sweeping crescendos, morbidly grand gestures and patient eruptions lurking in the band's catalogue amidst tongue in cheek humor, celebrations of club culture and the payoff of deftly wielded cinematic flair. There is a beautiful sort of informed populism to the Scottish veterans long romance with forging their own way, far beyond the narrow "indie rock" peg they were initially handed. It's a thrill to hear Mogwai's sense of control more than ever, conservative energy capping certain parts at a gentle murmur. 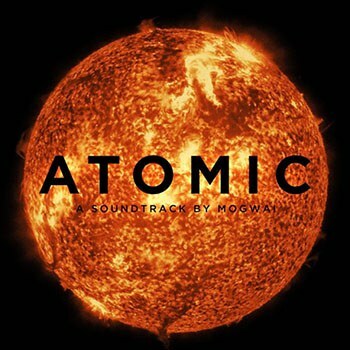 Their work on the Les Revenants soundtrack was otherworldly, whereas it is astounding how Atomic, an album composed of reworked versions of the music recorded for the soundtrack to director Mark Cousin's documentary Atomic: Living in Dread and Promise, has feet firmly planted in learning how to live with, if not love, the bomb. If you are impatient, you'll dread wondering if some of the songs are going anywhere, but most listeners will be fully rewarded with the promise that even the most ominous music on here is leading up to something transportive. Mogwai tackle soundtracking the fear of the bomb with a smart emphasis on how delicate and sacred life is. Much of Atomic balances the bright hope of atomic energy with the neurosis of yet to come duck and cover drills and the surreal repercussions of Hiroshima. Y'know, small potatoes thematic stuff. Just kidding. "Are You Dancer?" respectfully sets us down with gentle introductory indie piano sparseness. In the video for "Ether", you literally see grass grow and die. "Bitterness Centrifuge" is more kinetic, a growing unease wed to the sort of potential for pride, glory and promise you'd expect from Foo Fighter's Sonic Highways or the Italian Futurist inspired black metal artwork and themes of criminally underrated bashers Absentia Lunae. While "Bitterness Centrifuge" is sonically more akin to the layered charm of the more self loving ...Tomato Ketchup-era Stereolab meets the growing dirge of Hypothermia than the bombast of Mogwai's own Mr. Beast's bigger rock moments, the song manages to make you hallucinate old news reels forcefully. There is an almost chamber music reminiscent reverence and stillness in some of these songs, calm before, after and during the storm moments lesser bands would completely bungle. The most terrifying moment of the album that can literally make your thoughts race is how delicate life feels during the band's back to back "Fat Man" and "Little Boy" numbers, songs that are like padded walls insulating us in a bubble from the awful truth of the violence they soundtrack. It's enough to make your emotions overload and your head feel stuffed with blood soaked cotton balls at the scope of human folly. I was introduced to Philip Glass classic "Einstein on the Beach: Knee Play 5" last year. The song truly blew me away, made me cry and stare at my ceiling for a long time, utterly overwhelmed at the miracle of everything and wanting to open the shutters to let any positive affirmation born of pain ever cooped up to long shyly out into the atmosphere to take flight. Without being dramatic, it is fair to say Atomic has several moments like that where you are left wanting to grab on to whatever or whoever you hold dearest in life and thank them profoundly while crossing your fingers and living on a wing and a prayer. So profound you don't need words to express it. "U-235" is perhaps the pinnacle highlight of Atomic. The closest in places that Mogwai have ever come to sounding like Enya, the borderline dream pop slow pulse of synth and shimmer is all the best aspects you likely loved about Rave Tapes with a more heavy thematic direction. There are a few spots in the tune that would kill for an unlikely Crystal Sister cameo. You can feel the press of the Cold War, the hand wringing and tension as well as the electric hum of invention in these tragedy filled songs. The sense of curiosity is as palpable as the fearless problem of tackling such a big theme boldly when at the end of the day a project like this is bound to be just a small, if beautiful window into the karmic wheel of a reality stranger than fiction. Ever ambitious even at their most laid back, Mogwai are a band like fellow trouble makers Mercury Rev who manage to keep astounding release after release, however hard they try to also make us shake our heads and laugh. It's a wonder we ever manage to get along and do anything together as a species, but the real wonder is that we don't. History offers so many reasons, from Scorpions' hit "Wind of Change" and the Berlin Wall to Reagan and Gorby shaking hands to the thrill of giant festivals where masses of different types of people co-exist, for why we ought to try harder to honor the sacrifices of the lovers, dreamers and even scientists and soldiers who took leaps of faith or tried to deal with impossible challenges. The key is likely never losing your sense of wonder and hope for love even if the world tries to kill it.